Certificate: I have no certificate, but I had the pearl examined and appraised by Joshua D. Lents of the Gemological Appraisal Laboratory of America, Inc. in New York City. I discovered this northern Quahog pearl in February 2016 in a batch of Quahog clams that I purchased at my local fish market in the Hells Kitchen neighborhood of Manhattan. 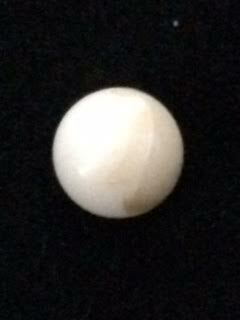 In addition to a slight orange tinge, this pearl also has a thin line on a portion of its surface.